This power reclining sofa is an example of affordable comfort. It has enough room to seat three people at once. Recliners are built into the piece to enhance the amount of relaxation that the sofa offers. Plush padding is distributed throughout the piece, creating padded footrests and plump headrests. Use this sofa in casual styled living rooms and family rooms. The 0588 Power Recline Sofa with Seats for 3 by Corinthian at AHFA in the area. Product availability may vary. Contact us for the most current availability on this product. Arm Pillow arm rests are often seen on casual furniture and reclining furniture. They offer a relaxed look as well as plenty of comfort whether you are sitting up or lying down. This reclining living room collection is a great choice if you are shopping for affordable comfort for you home. This group features reclining pieces that are perfect for the living room and family room. Each sofa, loveseat and chair has a casual style with plush padding. 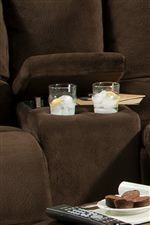 The loveseat is the distinguishing piece in the group with a storage console and built-in cup-holders. The 0588 collection is a great option if you are looking for Casual furniture in the area.